Learn More about Metallic Substrates from Metglas®, Inc. In recent years, metallic catalyst supports have begun to replace the ceramic substrates used to support precious metal catalysts. In addition to being sturdier and resilient to vibrations, as well as enabling the unit to be mounted closer to the engine, the metallic supports heat up faster to reduce harmful emissions. The cells of these units are formed from approximately 100 µm (4.0 mil) thick corrugated and flat sheet stock. The concentrically wrapped corrugated and uncorrugated metal sheets must be securely fastened to each other forming an integrated core to prevent vibration and potential release of catalyst during engine operation (which would result in unit failure). Brazing is an important technique for manufacturing the advanced metallic catalytic converters, because it achieves fastening of core components and core to the case in one operation. 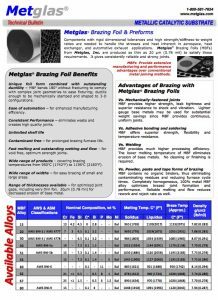 When using Metglas Brazing Foils (MBF’s) versus powder, smaller, high-quality fillets are formed. As a result, cells become more open, thereby reducing exhaust back-pressure. MBF’s foil leaves more effective surface area for the catalyst. Finally, process automation is easily achieved with ductile MBF’s foil. Note: For a typical FeCrAl base metal, MBF’s 50 with its low boron content provides superior high temperature strength and corrosion resistance with virtually no base metal erosion.